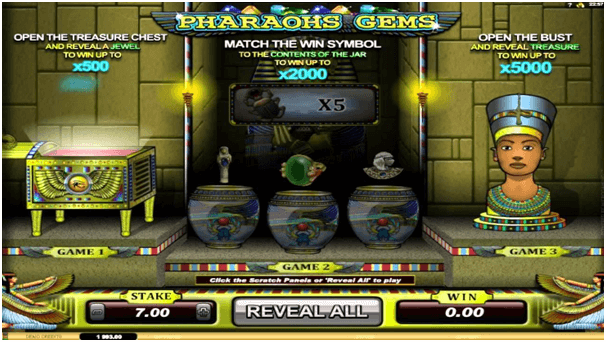 Pharoah’s Gems is powered by Microgaming and here in this game you will see three bonus games. The first one is placed on the left side of the interface and called “Game one”. There you need to open the treasure chest and reveal a jewel! After doing that you will get your bet x500. In the second game “Game 2” you are to match the winning symbol with the contents of the jars. It allows you to win x2 000! And “Game 3” makes you open the bust and reveal treasure to win x5 000. All the rules are written above the symbols, so it will be easy not to forget them. Pressing “New card” button you will start the session. From the chest, there will be either blue dust or special gems, with the multipliers. Opening the jars, you won’t know what symbol is winning as it will appear on the monitor above and pressing on the Bust of Cleopatra you will see how treasures are getting out of her head.